Troy’s robotics teams used hands-on experience to win a local tournament and advance to the 2019 Missouri State VEX Championship. 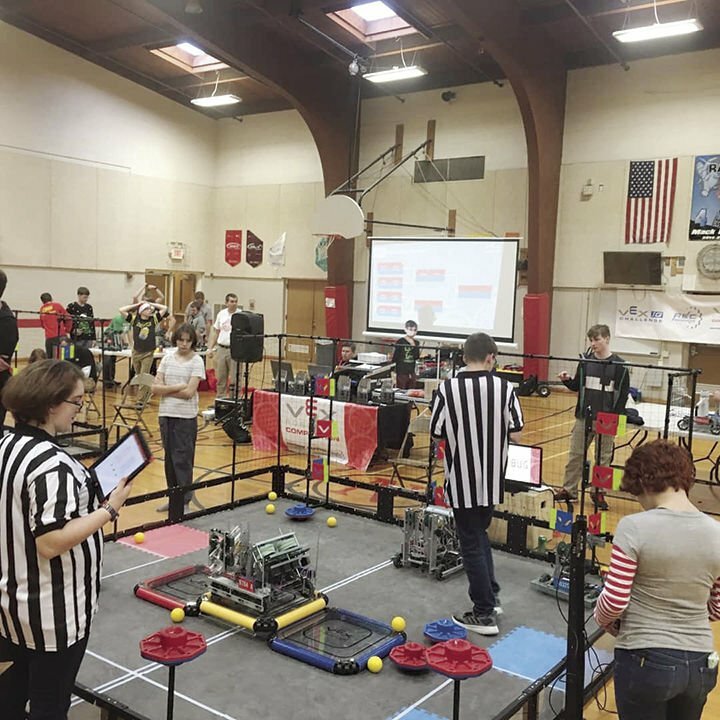 On Saturday, Dec. 15, Troy Buchanan VEX Robotics Teams 9784 C and A advanced to the championship, which will take place on March 9, after competing against 44 other teams at a tournament in Kirkwood. Teams compete with student-built robots capable of incorporating multiple scoring methods that can be found on the “field,” which is a 12×12 area with one foot tall plastic walls. Dawson Jeffers, a sophmore and member of team 9784 C, explained some of the ways a robot can score points. “We have to collect and shoot balls efficiently, pick up caps and stack them on poles and climb base boards,” Jeffers said. In the VEX robotics organization, teams spend the season building and programming their robots and are required to keep an engineering notebook to record progress. They can attend as many or as few tournaments as they want to. The top teams at each tournament advance to the state championship, and from there can then advance to worlds, which takes place in Louisville in late April. The TBHS VEX robotics program, now in its fourth year, has between 20-22 kids who are split into five teams of four-five students. In past years, a Troy team won a state championship in 2017, and teams have attended the world championship for the 2017 and 2018 seasons. This season, teams practice twice a week, sometimes more as they get closer to a tournament. The Kirkwood tournament was the first one Troy attended this season, and TBHS will host a tournament on Jan. 12 that teams from around the state will attend and that will be open to the public. VEX goes hand-in-hand with the STEM-based Project Lead The Way (PLTW) curriculum used at TBHS. While PLTW classes focus on teaching foundations of engineering, science and computer technology, being on a robotics team gives students the freedom to explore the concepts they learn in other classes. Both Troy middle schools also have robotics programs, giving kids an early start to get hands-on experience in areas of science and technology. Being on a robotics team gives students a taste of what their future can look like in multiple aspects – from actually building and programming robots, to learning how to work as a team, and even improving people skills as different teams fundraise to buy better materials.